Abbey Green produces mini lop and netherland dwarf rabbits. From time to time, we may have adults available for re-homing (rescue/rehome or retired from breeding). 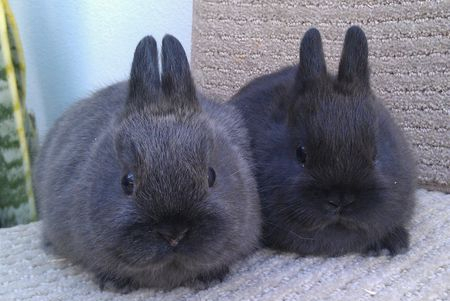 Mini lops are a small, lop eared breed who are very intelligent and interactive. Smaller than dwarf lops, they can be trained to use a litter box, come to their name, and perform basic tricks. Mini lops are generally well suited for children as they are naturally inquisitive, and fairly robust for their size. Their nature is often described like that of a dog as they tend to be very people orientated and will usually seek out attention. They are super intelligent and great fun for all ages. The more affection you give, the more you will receive. The Netherland Dwarf is the smallest rabbit variety in Australia with a show maximum of 1.1kg. They are packed with personality, and are characterised by short stubby ears, their small size and bold eyes. The netherland tends to be a very clean rabbit, who keeps their hutch tidy and is easy to litter train. A little more fragile in bone structure than a lop, but well muscled, giving a cobby appearance. Their size means they are best suited for older children and adults, or children who are very gentle. The netherland dwarf was once described as a timid breed, however selective breeding over many years has seen their temperament become more calm and friendly. They are often described like a cat, in that they are happy to be held and can be very affectionate, but they can be a little more independent than a lop. At Abbey Green, we strive to produce quality purebred mini lop rabbits that are true to type, with good health and temperament. Mini lop rabbits are the smallest breed with lopped ears and the show standard maximum adult weight is 1.6kg. The dwarf lop is a bigger breed, weighing 1.93-2.38kg. Mini lops are highly suited as pets due to their outgoing, affectionate and inquisitive nature. They are very intelligent and can be trained (litter box, tricks, come to name). Our netherland dwarf rabbits are true to type, with good health and temperament. Netherland dwarf rabbits are the smallest breed suitable as pets, with the show standard maximum adult weight of 1.1kg. They are small enough to fit in an adult's hand and are characterised by their cute short stubby ears and compact bodies. They can make loving pets and tend to have very clean habits. Please read the Purchase Information section before contacting Abbey Green. This page will likely answer many of your questions, thankyou. The average life expectancy of a rabbit is 7-10 years, requiring daily care. While they don't require walking, and wont bark to disrupt the neighbours, there are important care requirements to ensure your rabbit has a long and happy life. Read our care info section to get a sense of whats involved. A happy and affectionate rabbit is one that has regular, gentle social interaction and stimulation (eg. playtime and cuddles) in addition to it's basic needs being met (safety, a clean shelter, appropriate diet and fresh water, vet care as needed). The more love and gentle attention you give a rabbit, the more friendly and interactive it will be. They are very intelligent and can be trained if you are prepared to invest the necessary time. Young children require supervision to ensure safe handling. Rabbits make great pets if you understand and cater to their requirements. Our babies are handled daily to ensure they are friendly and calm. Scroll down the page to see our babies who are available for adoption. If you would like to meet a baby, check out the Purchase Information and contact us VIA SMS OR EMAIL to arrange a visit. As a general rule, we like for people to visit and meet the rabbit they are considering to adopt. This allows you to get a feel for their personality and ask questions. We understand its not always easy to visit (time/travel), you may want to surprise your family, or you may have your heart set on a particular bunny and don't want to risk missing out. In these cases, please provide a little information about the home you are offering, and a bank transfer deposit can be arranged. We are selective about the homes that adopt our precious babies, so please don't be offended if we ask a few questions to help us ensure our bunnies are a good fit. We reserve the right to refuse sale if we consider it in the best interests of the bunny. A 50% non-refundable deposit is required to reserve the rabbit of your choice. Rabbits are not considered sold until deposit is received - NO EXCEPTIONS. All rabbit babies come with first vaccinations at 4 and 8 weeks of age, initial food, care information, treated for parasites (internal and external), teeth checked, nails clipped, and pet follow up support from a breeder with 15 years of experience. Remember, the average life expectancy of a rabbit is 7-10years, requiring daily care and attention. An adult must assume responsibility for the rabbit. Only loving, long term, responsible homes need apply. Thankyou.